Join us for a spectacular event hosted by High Note at one of Downtown West Palm Beach ‘s most loved venues Voltaire WPB. Our show is jammed packed with 3 superstar divas in the South Florida area. 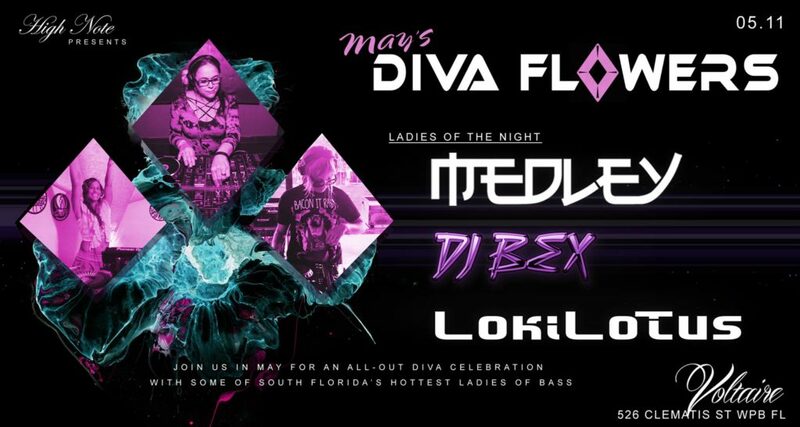 First and foremost is an All-Star Favorite DJ Medley, known for her outstanding performances in the South Beach & Fort Lauderdale areas. Then DJ BEX (Rebecca Torres), always known for shredding the beachy northern parts of sunny Florida with her talent. And last but not least, Lokilotus (Jesse Dunn), a hometown local favorite spinning amazing body moving beats since the 90’s. All 3 divas will be flooding our souls with a collection of rhythmic tunes on May 11th starting at 10pm and ends at 4am with opening and closing sets from Mr Palm Beach.